Make someone's day special by giving her flowers today. 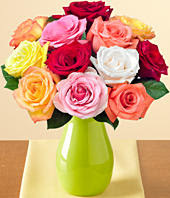 Flowers bring smile to every woman's faces when they received it on a special day or no occasion at all. Giving flowers show warmth, appreciation, love, care, sympathy and of course like I said it can bring smile on anyone. We can give flowers on special occasions like birthdays, Valentine's Day, Mother's Day, anniversary, or just about any or no occasion at all. There are various types and arrangement of flowers that you can choose. Here are ProFlowers promo codes that you can use to save you some bucks when you order.